This recipe is based on one I’ve been using from Deborah Madison’s cook book “Vegetarian Cooking For Everyone” which is a book I can recommend that everyone have a copy of. It’s that good. This is an easy recipe for anyone to make, even if you’re not experienced making other breads. If you have a baking stone, put it in the oven right now, before you forget. A baking stone is the best way to bake pitas, though you can use a regular baking sheet if you haven’t got one. The stone should heat up with your oven. Put two cups of water in a large mixing bowl, stir in the yeast and honey, and set aside until foamy, about 10 minutes. Meanwhile oil a bowl for the dough. If your yeast never gets foamy it’s probably dead because you don’t bake often enough and you should use some fresher yeast. Stir in the salt and olive oil, then beat in the multi-grain flour until smooth. 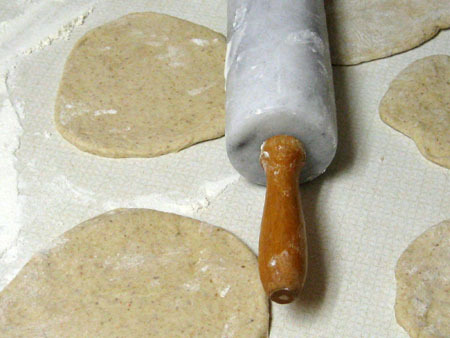 Add the remaining flour in small increments until the dough is too heavy to stir. Turn it onto a counter and knead it, adding more flour as needed, until the dough is supple and and smooth. Form it into a ball and put it in the oiled bowl, turning it to be sure the top is oiled. Cover with towel and set aside until doubled in bulk which should take about an hour. Punch the dough down and divide it into 8 pieces if you want large pitas, or 16 pieces if you want smaller pitas. I like the smaller ones better because they are the perfect size for a mini pizza for one. Roll each piece into a ball and set them all aside covered by a damp towel or do as I do and just leave them lying around the counter until it’s time to roll them out. At this point preheat the oven at 475 degrees. Let the dough rest while the oven preheats. When the oven is ready I roll out as many pitas as I can fit on my baking stone, which is 4 if I’m making large ones, or 6 if I’m making the smaller ones. Place each one on the baking stone and let them cook for a bout 3 minutes each. Mine never completely puff up and I don’t know the reason why. Generally speaking each one will at least partially puff up and the occasional one will completely puff up. I check the bottoms of the pitas to see if they’re done- they should have only the slightest golden coloring on the bottom. I roll out the next batch while I’m waiting for the current one to cook. If you happen to have an enormous kitchen you could roll them all out at once, but then you must not stack them on top of each other or they will stick together. 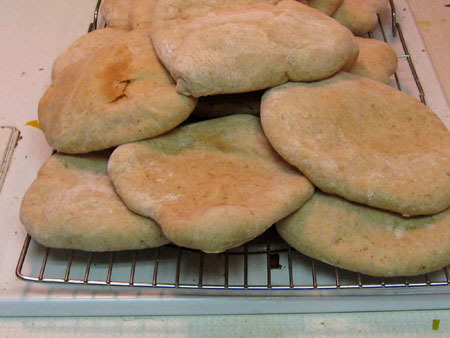 Let the hot pitas cool down on a cooling rack high enough up that my dog doesn’t eat them. This entry was posted in Baking on April 26, 2009 by angelina. this is so cool!! I’ve never thought to make pita bread but I just might have to try it with this recipe and fabulous visuals. Oh how I love the visuals…they make everything connect. It’s so easy and so much better than store bought. I was never a fan of pita until I ate it fresh in Israel- they don’t use it as a pocket bread, it’s a flat bread they use for tearing and scooping up spreads. I bake my pita on the frying pan with a little olive oil. Fun to watch the puff up. So tasty and a great way to motivate a fussy 3 year old to eat. She piles the food on or in it and munches it down. I keep saying I’m going to try the stove top method and still haven’t. Either way I have become spoiled with the home made and never buy it any more. These are great, I made them last week, so easy and much tastier than bought ones! They froze really well too, I’ve been defrosting them in my toaster for lunch. Thanks for sharing this!